Some other species of protozoa are sessile and need a support to grow. Many attach themselves to algae, or to bryozoa like Bugula stalks. In the Peritricha family, the best known are Vorticella, the 'bell animacules', with their elegant inverted bell fixed at the tip of a stalk. 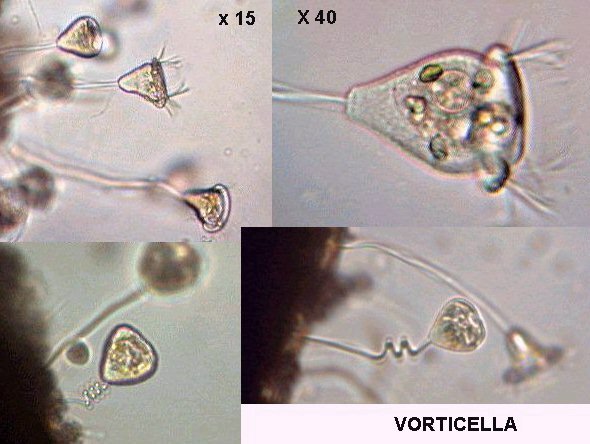 Vorticella are solitary individuals. In the enlarged view of the bell (x40) you can see a perfectly round vacuole. These specimens colonized a bryozoa (Bugula). Vorticella have an amazing property: their stalk is contractile and can be coiled up like a spring. The stalk contains liquid and a contractile cord. The organism's body is contained within a rigid lorica, topped by a crown of whirling cilia, which creates water currents that draw food particles toward the mouth. 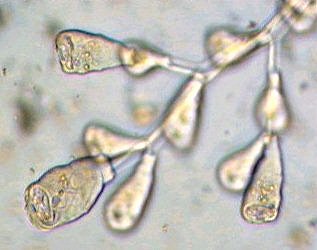 When the cilia are knocked by large particulates or other ciliated protozoa, the stalk contracts, pulling the bell quickly to the stalk foot. Contraction causes the stalk to adopt a spiral shape. (See the two lower pictures above). Some seconds later the organism progressively assumes its primitive appearance. Don't confuse Vorticella with other species of PERITRICHA (it may be for example, Carchesium, picture left) which look like vorticella, but they live in colonies on the same stalk and retract together. See video clip of a group of these. Another member: Cothurnia (right) with its lorica fixed on Bugula stalks. Cothurnia has a short stalk within a lorica but not Vaginicola (below). Often two individuals share the same lorica. 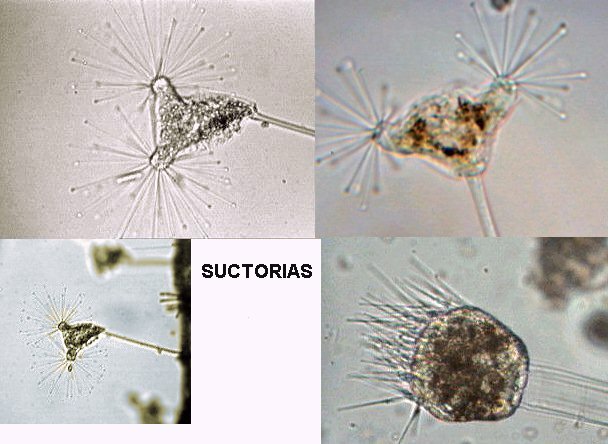 Not all these protozoa like sea water containing organic materials and nutriments. They are often associated with algae near the surface, in areas free of water currents. If you can to go to a harbour, often old piles or submerged ropes are covered with many species of algae, mussels, bryozoans... and constitute a good environment for a search of these protozoans. All the pictures have been taken of living specimens. All specimens, except the Tintinnids, were caught with a plankton net, other protozoans have been sampled from a single submerged rope alongside a boat, which bore five species of algae, three bryozoans, four species of tunicates including a clavelins colony and botryllus, three species of cnidarians, sea anemones, mussels and even one sponge: in the sea, life makes use of all kinds of support! Boat hulls also are covered with many organisms, but it is a little difficult to collect them. 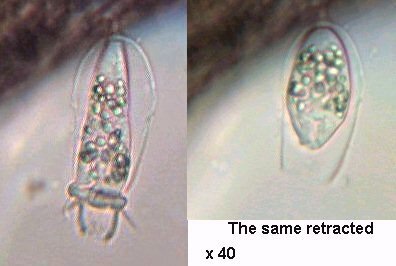 It's not easy to make permanent mounts because protozoans retract or are severely distorted by fixative or mounting processes. You can't use Nigrosine to make dry stained smears (as it's used to show cilia on freshwater organisms) because this chemical forms deposits when mixed with salt water.